There's more to the DJ scene than just hip hop, something that FreeStyleGames says it didn't reflect properly with the first DJ Hero. FreeStyleGames is being very careful about the amount of rap and hip hop it puts into DJ Hero 2, because it thinks it had a little too much of it in the first game, and not enough of everything else. DJ Hero 2's creative director Jaime Jackson said that around 60 percent of the mixes in the first game were hip hop, with every other genre crammed into that remaining 40 percent. Jackson said that the sequel had a much more varied song list, as FreeStyleGames wanted to make sure that every aspect of DJing was represented, not just hip hop. Obviously, the game still has some hip hop, but alongside the likes of 50 Cent and RZA, DJ Hero 2 will feature music from artists including the Prodigy, The Chemical Brothers, Lady Gaga and even Metallica. Activision released DJ Hero back in October last year, whereupon it received decent reviews but lukewarm sales. The game proved to be a slow burner, however, eventually hitting sales of over 1.6 million and paving the way for the sequel. 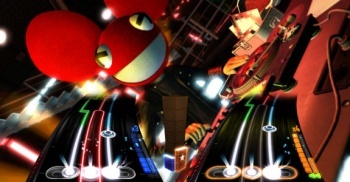 DJ Hero 2 comes out for Wii, Xbox 360 and PS3 on October 22nd.